Anguish. Violence. And ultimately, surrender. 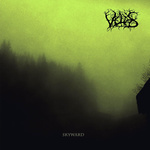 The cavalcade of sound heralding the arrival of Skyward – second release of Slovenian, atmospheric black metal project Veldes – sinks its mouldy digits into your soul as quickly as you can push play on this emotive ode to nature and despair. Behind the slow and frosty guitars that evoke earth and sky (and the truly tormented vocals shreiking as much from within as without), tastefully wrought piano lines pervade, serving not only themselves with a shroud of beauty, but also providing an iron core for each song to spring forth from in strength, much like how ivy-overgrown train tracks give a sense of direction and distance, long after they’ve been abandoned. In the music of Skyward, as listener, you’ll experience abandonment of another sort – that inviolate separation between the ‘reasoning’ life in the human world, and the loss of the once-shared purity of flora, fauna, Earth, Sun and sky lying parallel to it. This entry was posted on July 30, 2014 at 8:09 pm and is filed under ALL REVIEWS, V-reviews.You can follow any responses to this entry through the RSS 2.0 feed.You can leave a response, or trackback from your own site.